A few months ago, two young women health workers were executed by a Boko Haram faction in Nigeria. Saifura Hussaini Ahmed Khorsa, 25, and Hauwa Mohammed Liman, 24, were both midwives with the International Committee of the Red Cross (ICRC) in the state of Borno and were abducted in March along with the UNICEF nurse Alice Loksha, who is still alive. At the time of their abduction, all three were providing essential prenatal care to communities in Rann, a small town whose population has more than doubled since it became the location for a camp of around 45,000 internally displaced people. Saifura, as her father said, “was serving humanity”. The deaths of Saifura and Hauwa were the latest and tragic examples of the dangers faced by workers when delivering public services. However, it is not only in the extreme conditions of conflict zones that workplace violence occurs, although the health sector, which has a predominantly female workforce, is particularly affected. So much so that the World Health Organization (WHO) calculates that violence in this sector accounts for 25% of all incidents at the workplace. “Violence is not only perpetrated by those who are directly involved in labour relations, such as managers and colleagues, but also by patients, family members and visitors”, says Irene Khumalo, the new Chair of the PSI’s World Women’s Committee and member of the Swaziland Democratic Nurses’ Union. Khumalo notes that wars, internal conflicts and economic crises make the situation worse. 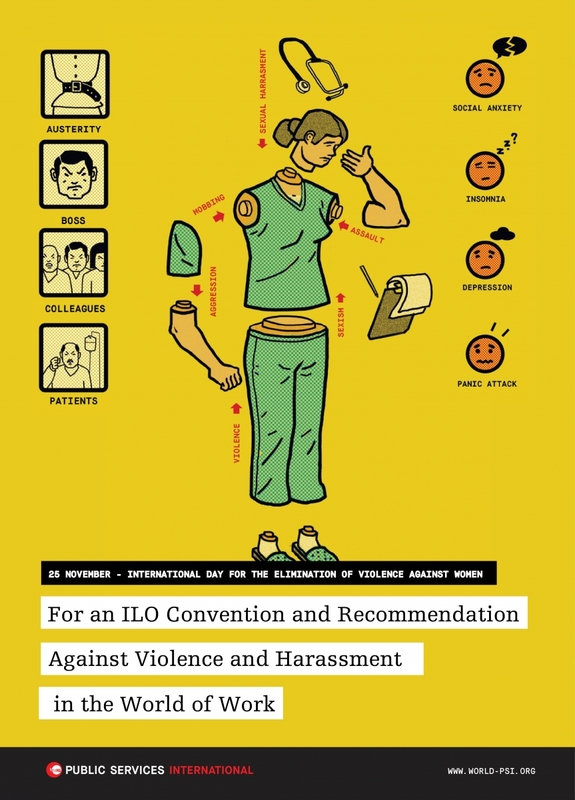 It is in this context and on the International Day for the Elimination of Violence Against Women that PSI reiterates its commitment to the discussion and adoption of a Convention and Recommendation to End Violence and Harassment in the World of Work by the International Labour Organization (ILO) in 2019. We believe that this convention should be seen as the outcome of the long struggle by women in the international trade union movement for an instrument that addresses gender-based violence as a multi-sectorial and systemic issue in the world of work. Women began this journey a long time before 2015, when the ILO’s Governing Body decided to put discussion of the instrument on the agenda of the International Labour Conference (ILC) in 2018. 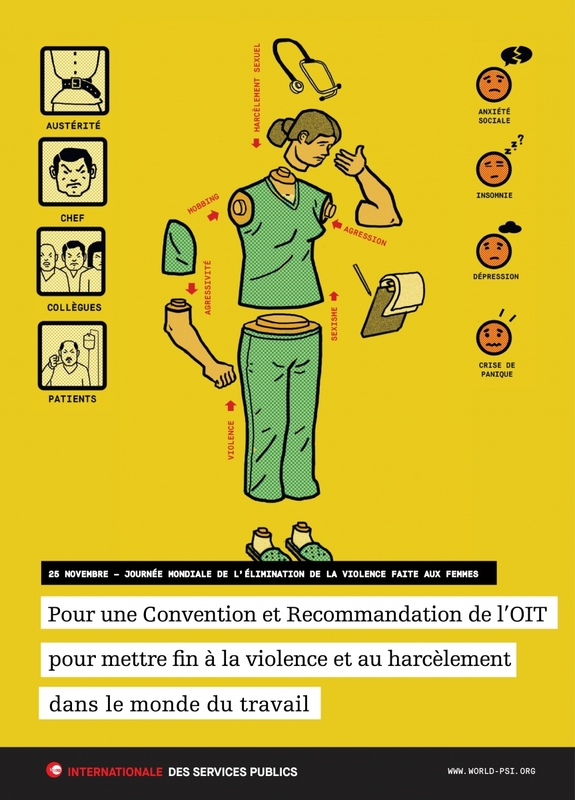 The initial focus was gender-based violence, but the ILO broadened the scope, form and content of the discussion to include the world of work as a whole in order to address the many manifestations of violence. PSI argues that sufficient resources must be allocated to basic services like health care if they are to have the material foundations necessary to function without the threat of violence against either workers or service users. It also calls for the formulation of public policies able to provide gender-responsive public services.